Remember the thrill you had when you were a teenager? Finding out that he likes her, or vice versa? Finding out about the latest school gossip that is sweeping the campus? Judy sure does! Date with Judy revolves around the life of Judy, a teenager who spends her day on the telephone, arranging, discussing, and lamenting the lack of dates. "Her idea of the end of everything is the night the phone doesn't ring by 6:30 (signoff time in the West) to announce the arrival of a super date." The show was chock full of infectious giggling and teenage slang, such as "Oh, how dreeeaaamy!" So, come and join Judy in her zany teenage adventures. It will be "far out!" See also: Henry Aldrich (Aldrich Family). I should relate how much OTRCAT has changed our lives. 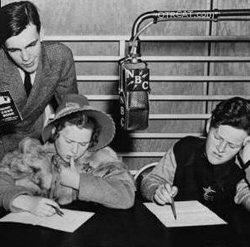 We had listened to old time radio programs for a long time, mostly well-known dramatic shows of my choosing such as Suspense, Escape, and Johnny Dollar serials. Over the past five years, since we began ordering MP3 CDs from you, what was predominantly my interest has developed into a full-shared love of old time radio over a surprising range of genres and a mixture of major and obscure shows. Your sampler disks exposed us to many shows we would never have found any other way. We find enjoyment not online in listening but in planning our own program schedules. None of this would have been possible without your efforts to collect old time radio shows at affordable prices. 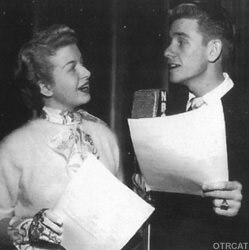 A Date With Judy began in 1941 as a summer replacement for Bob Hope. Louise Erickson was the third Judy, holding the role from 1943 until 1950, when the series ended. Judy was popular enough that a movie starring Elizabeth Taylor was released in 1948. A TV series ran from 1951 to 1953. And a comic book was isued from 1947 until 1960.